Remember the wave of anti-French sentiment in the U.S. in 2003? Some American restaurants rewrote their menus to offer “freedom fries” instead of French fries, and national TV networks aired scenes of angry Americans dumping bottles of French wine to protest France’s resistance to U.S. talk of an invasion of Iraq. Then-president Jacques Chirac of France couldn’t get a break on U.S. or British media. His explanations for why he wouldn’t join an invasion force were hard to find among all the denunciations of France. The anti-France campaign was a painful reminder that Chirac’s country – once a powerful global empire and still one of the five permanent members of the United Nations Security Council – has steadily lost its global footing over the past several decades. To counteract that, French officials had long debated the creation of a global TV service – a la Britain’s BBC or America’s CNN – to put a French imprint on the news. The French government finances the network, and it shares some resources with state-funded France Television, which serves a domestic audience. But it also has a partnership with the private channel TF1, giving it additional equipment, technical staff and access to that channel’s reporting. According to the government, France 24’s English service is distributed to 105 million homes around the world. The French language version is distributed to 96 million homes, and the Arabic service that began transmission in 2007 is available in 67 million homes. The total budget for the three channels in 2011 was set at $145 million, according to a finance bill introduced in the French Senate. Although the availability numbers are impressive, actual viewership is considerably smaller, according to the finance report. Twenty million households watch the English broadcasts, for example, with the largest proportion of those viewers in Europe. The channel’s French version may be a bigger challenger to BBC and CNN. It is popular in Francophone Africa (the number one global channel there, according to French government reports). In France’s former colonies in Northern Africa, Algeria, Morocco, and Tunisia – also referred to as the Maghreb –its viewership is second only to Al Jazeera, according to the government. 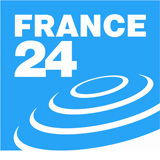 France 24 offers professional, objective reporting from a large staff of correspondents around the globe. While much of the world’s media largely ignored the political crisis in the Ivory Coast until its final violent stage this year, France 24 covered the story nonstop. France 24 was also among the first broadcasters to bring viewers in-depth coverage out of Libya, at a time when other channels were still focusing mostly on the Egyptian crisis. The channel’s reputation and audience help it get some exclusives, including an early interview with Libyan dictator Muammar Gaddafi. CNN had to be satisfied with interviewing a France 24 journalist about the interview, and not Gaddafi himself. France 24 reporters were the first ones to broadcast images from the frontlines during the battle for Brega, which was fought between Gaddafi forces and Libyan rebels. Today, the network employs 260 full-time staff reporters and has access to more than 700 additional reporters through cooperation agreements with France Television, Societe Television Francaise, Radio France Internationale, and Government Radio Network. While viewers in Africa and Middle Eastern countries clearly see France 24 as a welcome alternative to the often highly restricted media in their homelands, skeptics still question the service’s ability to take government money and remain independent. “We think France 24 will bring a different point of view, a different opinion, one that recognizes the diversity of the world,” said France 24 CEO Alain de Pouzilhac in an interview with the BBC. Pauline Eiferman, Elettra Fiumi and Umar Muhammad reported on France 24. Budget: $145 million a year (for three channels: English, French and Arabic). Audience: 105 million households (for English channel). Motivation: “We want to cover the world with our eyes, and our eyes are French eyes. And if I have to explain the French vision, I say that it’s a vision that recognizes the diversity of the world.” – Alain de Pouzilhac, Chief Executive Officer, France 24, December 2006. In a nutshell: France 24 is a young channel still struggling to figure out its place in the global media market. Its French and Arabic broadcasts have found loyal niche audiences in Arab and African countries whose own media are tightly controlled by the state. But it lacks the financial and technical resources to become a major global competitor to CNN International, Al Jazeera English and BBC. 4America has seldom been at the forefront of news in early 2011, but coverage of the U.S. budget and other issues is straightforward, with no clear bias. 4A global network of correspondents delivered steady reporting from hot spots such as Libya and Ivory Coast. Correspondents could be seen in the thick of unrest, literally interviewing rebels as they fired. An early interview with Muammar Gaddafi was a journalistic coup for the channel. 3The French government may fund the channel, but that doesn’t mean President Nicolas Sarkozy gets kid glove treatment. When his ratings hit a record low, it was news on France 24. But France wasn’t in the news that much; reports focused mainly on big international stories elsewhere. 2Anchors often sound unprepared, and technical glitches are not uncommon. Video packages are sometimes of poor technical quality, and some talking heads have difficulty expressing themselves in English. 4Good news judgment and solid reporting are hallmarks. The channel’s French version is popular in Francophone Africa, where its reports are considered significantly more credible than those of local, state-run channels. The government of Ivory Coast was so annoyed by its professional reporting that it banned France 24 for awhile.